Star Wars Adventures #3 kicks off with a self-contained story on a far off world with some strange alien life. 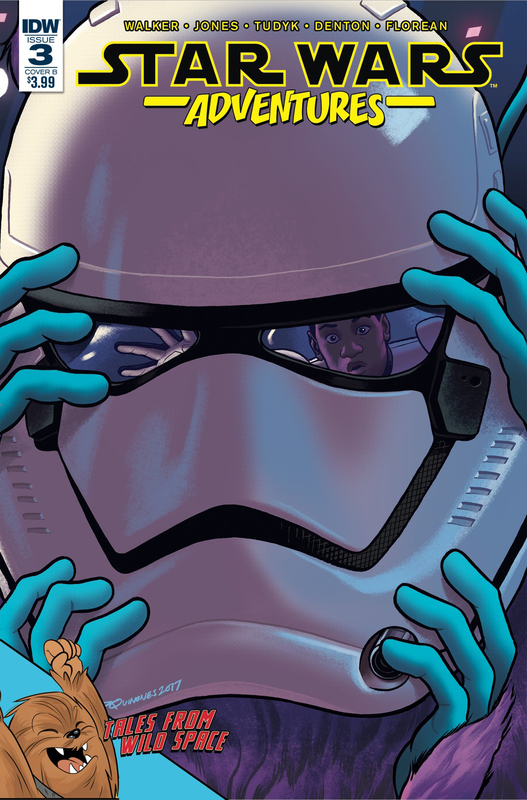 A First Order ship is there exploring the world, and trooper FN-2187 comes face to face with one of the alien creatures. It also manages to lead him on a merry chase around the Finalizer as he tries to get his helmet back. From a briefing room with Kylo and Hux, to the showers with Captain Phasma, this one has plenty of hijinks. Eventually they make their way to the planet, and FN-2187 tries to return the alien to its home, but more trouble ensues. The story culminates with Phasma ordering FN-2187 to kill the cute little alien. But this is a kids comic, so there’s a happy ending, and it’s smartly done. The second adventure in this issue is a tale of Cassian and K-2SO involving some Wookiee children. Cassian saves them from the Empire, but with a pressing mission elsewhere, leaves K-2SO to baby sit them while he goes off elsewhere. Of course it doesn’t go well as a stampede of alien rhinos threaten to destroy K-2SO and the Wookiees. However, the Wookiees prove their worth and save the day, thus earning K-2SO’s respect. It’s a fun little story with great artwork. Both stories keep things fun and entertaining, whether you’re a kid or an adult. With K-2SO himself, Alan Tudyk, helping to write the second story, it’s kind of a special comic as I can’t ever remember a Star Wars actor writing a Star Wars comic story. It would certainly make a great collectible for an autograph. That aside, it’s a fun read with cute artwork. Definitely worth checking out. I give it a five out of five metal bikinis.